The nomination of Rep. Aaron Frey to replace Attorney General Janet Mills, who will become governor in January, is likely to be affirmed in a vote Wednesday. 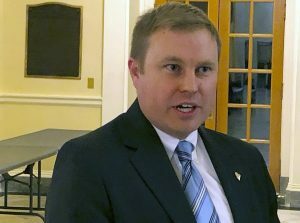 AUGUSTA — Majority Democrats in the Maine Legislature selected Rep. Aaron Frey, D-Bangor, to be the state’s next attorney general in caucus voting Tuesday, largely forecasting who will win the post when the entire Legislature votes on the position Wednesday. Rep. Aaron Frey, who stands to become Maine’s next attorney general, says he would oppose any federal policies that conflict with Maine values. It took four rounds of voting to select Frey in a runoff process. A total of 107 of the 110 Democrats in the Legislature participated in the voting. Frey, who won re-election to his fourth term in the Legislature in November, will likely decline to be sworn into that office so he can take the attorney general’s post, replacing Attorney General Janet Mills, who was elected governor in November. Unlike in most states – where voters choose an attorney general in a statewide election – Maine’s constitutional officers are selected by the 186 members of the Legislature, making it all but certain that Frey will be chosen Wednesday when the full Legislature convenes and Democrats use their new majorities to propel him to victory. Republicans are not even expected to nominate a candidate for the post. Frey, who has served on the Legislature’s Appropriations and Financial Affairs Committee, was running against fellow Democrats, including two state senators, Mike Carpenter of Houlton and Mark Dion of Portland, as well as Tim Shannon, a Yarmouth attorney, and Maeghan Maloney, the district attorney for Kennebec and Somerset counties. Maloney served one term in the House of Representatives from 2011 to 2013 before becoming a district attorney. Campaigning for the post has gone on largely among majority Democrats and mostly behind the scenes. He also promised to be a backstop against any federal policy pushed by the administration of Republican President Trump that would undermine protection of the state’s environment or limit its response to climate change. “That administration continues to propagate policies that are inconsistent with our Maine values, like environmental deregulation, relaxing important restrictions on financial institutions and dismantling Obamacare,” Frey said. He also said he would be tough on big industry, especially drugmakers who are taking advantage of Maine people. After his nomination Tuesday, Frey said his experience as a lawyer is largely as a defense attorney but he is confident that he could serve competently as the state’s top prosecutor. He said he would lean on an experienced and professional staff in the Attorney General’s Office and within the offices of the district attorneys. “As the chief law enforcement officer, it’s not just criminal law, but making sure that all laws are enforced in a dispassionate way that is constructive for all Maine citizens,” Frey said. Democrats also nominated incumbent Secretary of State Matthew Dunlap of Old Town to serve in that role again, and nominated Henry Beck, a Waterville attorney and former state lawmaker, to be state treasurer. Although Republicans have not announced a nominee for secretary of state, it is expected they will nominate State Treasurer Terry Hayes, an independent, who has served two terms in the post, to again serve in that position. That could set up the only competitive vote Wednesday as Hayes, who lost a bid for the governor’s office in November, will seek to cobble together enough support to win the post again. But if Democrats stick together behind Beck, his path to the office is all but guaranteed. Each incoming Legislature selects the state’s constitutional officers every two years.